My finger slipped and I went a bit mad in the ASOS sale and one of the things that arrived on my doorstep was this pretty spotted dress. It actually detatches and becomes a co-ord too. Amazing! It makes it even more of a bargain! It was something that was brought completely on a whim - the rest of the order was sensible tops boo! - but it's turned out to be my favourite item. It's going to be the perfect outfit to make that transition from day to night. Unpop the poppers and voila you're ready to hit the town! With my Glastonbury trip and my boyfriend's stag week to Ibiza, money is a little tight this month and probably next month too! But it was the boyfriend's birthday last Tuesday and I couldn't let it go without any sort of celebration so I gave him the choice to pick a day trip. As always we opted for the Big Smoke. But this time we popped to Brockley Market - more on that later this week - in the morning where we picked up some delicious treats and Greenwich in the afternoon. We decided to venture down to Greenwich park as it was sunny and we don't get many of those days in England! We treked up the hill to the Observartory and were rewarded with some cracking views of Canary Wharf, the o2 Arena and the Maritime Musuem. It was well worth huffing and puffing in the hot sun! Have you ever been to Greenwich? It has to be one of my favourite parts of the city. Now the summer has decided to make an appearance albeit a little hit and miss, I thought i'd share a few of my favourite cheek products that have been in rotation over the last few months. My all time favourite bronzer that I come back to time and time again is the Bourjois offering. It's such a staple product in my make up bag. I love the fact it's fairly matte and doesn't turn me into a glitterball. It's great value for money and lasts for ages as you don't need too much. Be careful when you apply as it can look a little 'muddy' if you're too heavy handed. I was kindly given the matte Liz Earle blush and fell in love from the first swipe. Again it's best to use quite lightly as it's very pigminted. It has amazing staying power and looks gorgeous when you have a bit of a tan. Alternatively it's great to use when you're feeling pale and need a pick-me-up. I picked up the Topshop cream blush on a whim as i'd been reading too many blogs and regretted the colour choice when I got home. I'm a bronzer girl through and through! It was a moment of madness and remained untouched until the weather started to heat up. Now I love it for a night out. It's not quite as scary as it looks in the pot! It's a great product to build up depending on what sort of mood you're in. It doesn't go streaky and glides on effortlessly. Finally the cream Maybelline blush was something I picked up whilst I was in New York back in April. I was immediately drawn to the colour as I thought it'd be great for a subtle everyday look. I was completely right and love it when I want to look glowing but also that I haven't tried too hard! I wish i'd picked up more of the range. What's your favourite cheek product at the moment? Have you tried any of my picks? 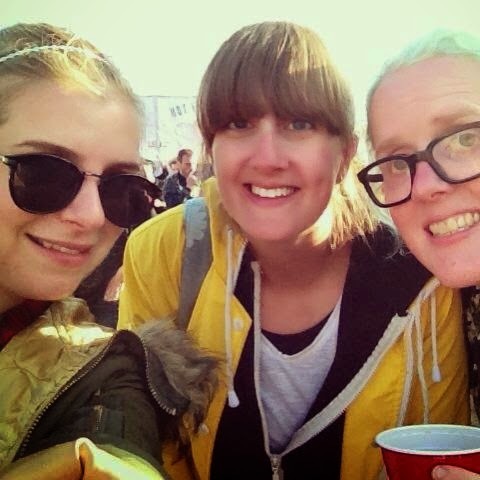 Well, I really don't know how to put into words just how utterly amazing Glastonbury was. It was without a doubt some of the best five days i've ever had. Bold statement I know. I knew it was going to be fun but really didn't anticipate just how much fun. I've been on a massive comedown ever since I've came home. It all seems like a bit of a blur now! Fingers crossed i'll be going again next year! We arrived on Wednesday in baking hot sunshine after Hannah and Lily had agreed to let my friend and I gatecrash their camp for the next few days. Unfortunately the beautiful hot weather was not going to stick around for too long and by Thursday the rain started to make an appearance and never really went away. Still it helped me get the authentic Glastonbury experience and I wouldn't have had it any other way. On the way back to the tent after the awesome Kasabian set I was asked who my highlight of the festival was and for once I was absolutely stumped and struggled to name just one. I'm still struggling to pick just one highlight! But I absolutely loved Kasabian - they just really know how to put on a proper show. I'll always have a soft spot for Tom! Dolly Parton was amazing and she was a joy to watch. Her little anecdotes had me laughing all the way through the set. Vance Joy was also a pleasure to listen too, it was fairly chilled as just what I needed at 12 in the afternoon. I wasn't in the right state of mind for anything too heavy! Kelis was outstanding too - I'd forgotten just how many of her songs I actually knew. Loved having a boogie to Milkshake! Did any of you lot go to Glastonbury? What was your highlight?